There's a wide world of film festivals beyond the major international fests. The Dissolve periodically travels to these events and checks in with what's on offer, and what it says about that particular festival. On the first day of the True/False film festival, I decided I wasn’t going to stick around for any Q&As. They’re a hindrance at festivals anyway, where there are always other screenings to get to (and meals to eat, writing to do, etc.). But I knew I needed to stay ignorant of the filmmakers’ thoughts and reflections during one of True/False’s “secret screenings,” which I watched after hearing only a one-sentence introduction, without knowing whether I was about to see a documentary or a fiction feature. Thirty minutes into the film, I still didn’t know, and I liked it that way. There’s something invigorating about being completely at sea in the middle of a film, unsure whether what’s onscreen is “real” or not. I can’t tell you anything about either of the two secret screenings I saw at True/False, because the festival organizers make attendees swear an oath of non-disclosure. True/False isn’t the only festival that holds these kind of hush-hush events; if anything, they’re becoming more common as regional festivals grow more prominent, and the major fests fight to hold onto the official “world premières” of certain films. But True/False does try to make the whole secret-screening experience more of an actual experience, with the non-disclosure pledge and color-coded screening names. (I attended “Orchid” and “Amber.”) It’s all part of the overall atmosphere of a festival that does dozens of tiny things to stand apart: decorating each venue differently; hosting parties, concerts, and art installations throughout its five-day run; having select volunteers dress up in colorful costumes; and hiring buskers to perform in the theaters before the movies. I’ve been to a lot of film festivals, but True/False is the only one where I’ve had to make sure to keep some dollar bills in my wallet, to tip the pre-show music. But while Columbia, Missouri is a wonderful college town, made all the livelier by True/False’s hospitality, all those little extras weren’t the reason I came to the festival. I came because I love documentaries, and True/False has built a reputation over its first decade of existence as one of the world’s more innovative, well-curated documentary festivals. That’s because True/False holds to a loose definition of what documentary means, making room for narrative features with documentary qualities, and non-fiction films that use expressive, fiction-like techniques. For example, this year’s True/False hosted a mini-program of Iranian neo-realist films like The Mirror and A Moment Of Innocence, which use non-actors to tell stories drawn from real life. The closing night film this year was Boyhood, Richard Linklater’s experimental drama, shot in pieces over the course of a decade, which observes a real kid growing up onscreen. 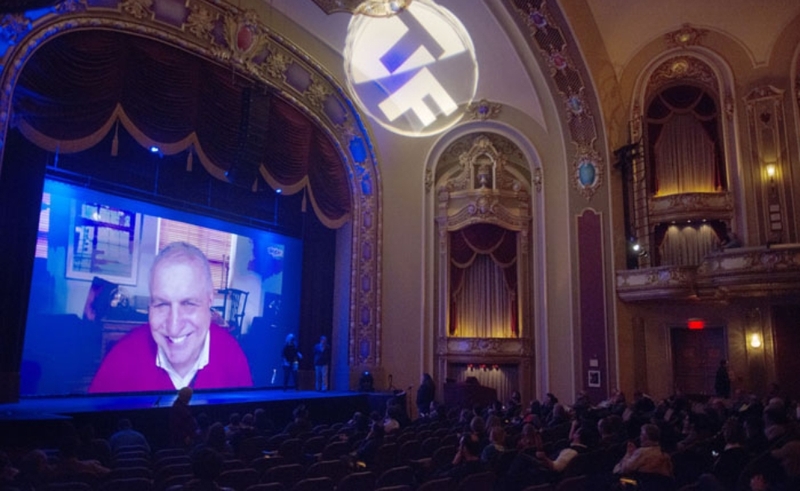 The fest also held screenings of Errol Morris’ The Unknown Known and the recent Sundance docs The Green Prince and The Notorious Mr. Bout, all three of which illustrate true stories of politics, war, and economics with scenes that have been staged, or that layer in special effects. And this year’s True/False screened the provocative essay-film Concerning Violence (another one I saw at Sundance), which contextualizes archival footage of unrest in colonial Africa through readings from a 1961 academic defense of armed revolution. The advantage of seeing a slate of movies that range freely across the documentary/fiction spectrum is that the distinctions start to blur, leading to movies that provoke that rare, remarkable unmoored feeling I mentioned up top. I had that same feeling at a film I can talk about: Actress, Robert Greene’s documentary about Brandy Burre, a theater-trained thespian who came closest to the big time when she had a recurring role on The Wire, after which she quit the business altogether to raise kids in a New York small town with her restauranteur boyfriend. Actress catches Burre as she considers going out for auditions again, at a time when her relationship with the father of her children is on its last legs. Greene clearly (and sometimes subtly) stages some of the scenes with Burre and her friends and family, raising questions about the extent to which “Brandy Burre” is just a character in her own life. That ties in to Actress’ overall theme, which is about this woman who seems to be leading a comfortable middle-class existence, but feels trapped by the parts she has to play as a mother and partner, and by the lack of control she has over her career and her domestic life. Even the fake parts of Actress serve a larger truth. Greene tells Burre’s story without a lot of setup or explanation. The subject addresses the camera, but there’s never a point where she says, “Hi, my name is Brandy Burre, and I used to be on The Wire,” or anything like that. Greene just drops viewers into the middle of Burre’s maelstrom and lets them figure out who’s who, what’s happening, and why it matters. It’s the same approach that Anna Sandilands and Ewan McNicol take with their work-in-progress Uncertain, a film named for a small Texas town near the Louisiana border. Way off the beaten path, the town of Uncertain tends to attract people with shady pasts, trying to eke out a living from a lake that’s slowly being overrun by a life-destroying weed. Reminiscent of early Errol Morris films like Vernon, Florida and Gates Of Heaven, Uncertain is an entertaining, gorgeously shot slice of life that’s simultaneously about nothing and everything. There’s no story here—unlike Actress, which has the dual hooks of Burre’s comeback and break-up—but by following a small handful of colorful characters, the filmmakers are able to express what it’s like to live in limbo, in a symbiotic relationship with a community in danger of dying out. It’s a gamble to attempt that kind of aimless ethnography on film, with no defined endpoint. And there are different ways to handle the “what happens, happens” documentary. True/False showed a film I saw last September at the Toronto festival, Manakamana, which relies on rigid structuralism, setting up a camera on a cable car leading up to a Nepalese temple, and just taking whatever the passengers give them during their 10-minute ride. While sporadically illuminating (and oddly suspenseful), Manakamana is a little too hands-off for my taste. Gianfranco Rosi’s Sacro GRA has more authorial stamp, as the director cuts together roughly a dozen mini-sketches of the people and communities dwelling around the Roman “ring road.” But while Rosi selects his subjects and shapes their lives into an impressionistic picture of modern Rome, he holds back from explaining how their stories fit together, or even who they are. I like both Manakamana and Sacro GRA, but I got more out of Sherief Elkatsha’s Cairo Drive, which follows a cross-section of Egyptian citizens as they navigate the country’s horrific traffic, both before and after Arab Spring. Elkatsha also doesn’t explain too much about who he chose to follow or why, but he doesn’t stand aloof the way Rosi does, and his footage adds up to something fairly easy to understand, showing how citizens motor along—sometimes selfishly, sometimes helpfully—irrespective of their government. The majority of the films I saw at True/False were challenging in the mode of Sacro GRA and Actress, pushing viewers to find their own threads and derive their own interpretations. Partly that’s because I’d already seen some of the more straightforward documentaries at True/False—including The Overnighters, Jodorowsky’s Dune, and Tim’s Vermeer—at earlier festivals. Still, I can’t deny that after a couple of days of docs that made me work hard, I initially found Rachel Boynton’s Big Men refreshing for how freely it spoon-feeds. Tracking the efforts of a small Texas oil company to drill in Ghana during changing political and economic times, Big Men keeps pulling back to the bigger picture of how the oil business has corrupted Africa, and how even the most powerful people have “big men” above them on the food chain. Boynton keeps the film’s style simple and direct: talking-head interviews, onscreen text and graphics, and news footage. It’s a good movie, but as it rolled on and kept making the same points, it occurred to me that Boynton either didn’t have all the footage she needed, or didn’t trust she could say all she needs to say just by following her main story. The Overnighters, by contrast, is set in the newly booming, overpopulated natural-gas communities of North Dakota, and rarely ventures outside its central narrative of a local pastor helping the homeless, but director Jesse Moss gets a lot out of this one person and one main idea, making a movie with more action than interviews. Big Men is the opposite. Maybe seeing so many quality documentaries consecutively made me more finicky; it’s highly possible that I’m underrating Big Men. But immediately after that movie, I saw Amir Bar-Lev’s latest doc, Happy Valley (which Nathan Rabin previously saw at Sundance), and it’s an example of how to do the conventional documentary form right. Bar-Lev too relies on interviews, archives, and the printed word to piece together a story that mostly happened before he arrived with his cameras: the saga of the recent Penn State scandal, in which esteemed football coach Joe Paterno allegedly stood mute for years while one of his longtime assistants, Jerry Sandusky, was sexually molesting young boys. Happy Valley’s subject matter is difficult, but not Bar-Lev’s approach, which resembles a really good piece of long-form magazine reportage, taking into account the history, culture, and the personalities of several major characters. 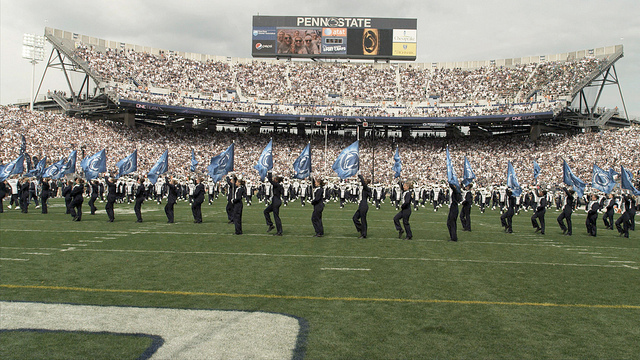 What makes Happy Valley work as a film is the way Bar-Lev puts it all together—up to and including the footage he shot of frenzied Penn State game-days and the fans who care more about football than any crimes committed. Like Bar-Lev’s earlier excellent pictures, My Kid Could Paint That and The Tillman Story, Happy Valley is about how people try to smooth out complicated situations into easily understood stories, with heroes, villains, and scapegoats. It’s clearly a documentary, but what Happy Valley has in common with the best of what I saw at True/False is that it unfolds like literature.